Tempt your senses with a mesmerizing blend of exotic flowers and sumptuous fruits. 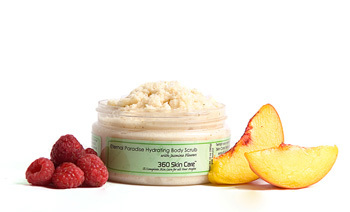 Let 360 Skin Care take you away with our Eternal Paradise Hydrating Body Scrub. Enticing aromas engulf you in a alluring fantasy as you resurface your skin with exfoliating Sea Salt, lush Avocado Oil and nourishing Cocoa Butter. Crushed Jasmine Flowers gently buff away dreary skin while Olive and Rice Bran Oils replenished the skin with nutrients to restore silky-soft beautiful skin.